COLUMBIA, Mo. – Dean Mills, dean of the University of Missouri School of Journalism, announced today that Stacey Woelfel, news director at KOMU-TV and associate professor in the MU School of Journalism, has been named the first director of the new Jonathan Murray Documentary Journalism Center at the MU School of Journalism. Woelfel will step down from his position as KOMU news director and begin working as director of the Murray Center on Sept. 1, 2014. The Jonathan Murray Documentary Journalism Center at the MU School of Journalism was created thanks to a gift of $6.7 million from documentary journalist and reality television producer Jonathan Murray announced earlier this month. The new program will offer bachelor of journalism and master of arts degrees and fund research that advances the field of documentary journalism. The bachelor’s degree program will be offered beginning in the Fall 2015 semester. The start date for the master’s degree is still under discussion, but could also begin as early as the Fall 2015 semester. Coursework for the degree will focus on the history, business models, advocacy and advanced production of documentary journalism. The program will feature two additional faculty members. 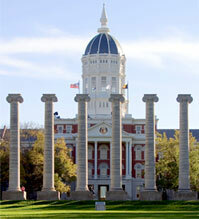 The search is underway for the first position, which is funded by Mizzou Advantage. Faculty from the School of Journalism and the Film Studies Program in the MU College of Arts and Science are currently interviewing candidates and hope to make a decision soon. The second faculty member will be a rotating position, filled by visiting professional documentary filmmakers for varying lengths of time. Woelfel is an associate professor at the MU School of Journalism and has been the news director at KOMU-TV, the MU-owned NBC affiliate for central Missouri, since 1990. Woelfel earned a bachelor’s of journalism degree from the MU School of Journalism, and master’s and doctoral degrees in political science from the MU College of Arts and Science. He is a winner of a Payne Award for Ethics in Journalism, an Emmy award, and an Edward R. Murrow award along with numerous regional and local awards. Woelfel is a past national chairman of the Radio Television Digital News Association (RTDNA), a member of the national board of directors of the Carole Kneeland Project, a member of the board of governors of the Mid-America chapter of the National Academy of Television Arts and Sciences, and has been inducted into the Silver Circle of the National Academy of Television Arts and Sciences.